All the models are painted sculpted and painted personally by Jean. Sometimes a sculpture is in stock, painted as a standard example of a breed. If you require a customised model you should allow plenty of time for your order especially if you are ordering for delivery just before Christmas. Each model is made from clay or wax using photographs and working from the live animals and taking advice from the breeders. Then casts are taken from the original and each one is individually hand painted. No measurements are taken and Jean works totally by “the rack of the eye” as they say. 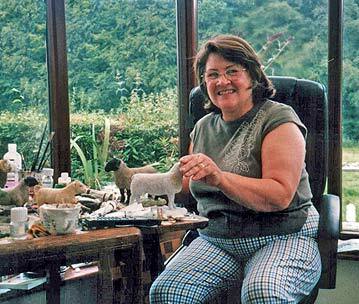 Every animal of any breed has different features but Jean tries to produce a good representation of the breed, paying great attention to markings and fleece colour. It is a great pleasure for Jean to hear farmers say “aye lass tha’s gitten it right”. The polished wooden bases are turned by a local woodturner, sealed and then polished to compliment the sculpture. Some of the sculptures are made in small limited editions, some of 500 and some only 250 or in the case of the Beef Shorthorn 150.